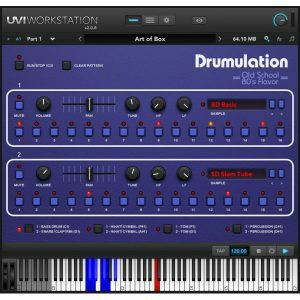 SAMPLE SOUND REVIEW: 67% off “Emulation II” by UVI (VST/AU/AAX) LIMITED TIME DEAL! Sounds from the 80's !! 67% off “Emulation II” by UVI (VST/AU/AAX) LIMITED TIME DEAL! Sounds from the 80's !! 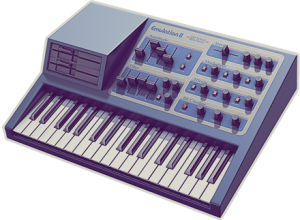 “Emulation II” is a Massive Library of Classic Synth and Drum Sounds from The 80s. Featuring a set of unique vintage instruments that reproduce everything from warm digital sounds to the most analog-ish textures, if you’re after that classic 80’s sound – you’ve found it! “Emulation II“ was designed specifically to reproduce the warm digital sounds and analog textures characteristic of 80’s music. A massive library of samples (nearly 5 GB!) was recorded from a professionally restored unit and utilized in this hybrid instrument – giving you the sonic character of real vintage hardware with the added control and sound shaping flexibility of analog modeled filters and advanced digital signal processing. This is definitively the ultimate digital version of the long standing professional sampler of the mid-80’s, that has been used by Depeche Mode, Peter Gabriel, Pet Shop Boys, New Order, Jean-Michel Jarre, Stevie Wonder, Genesis, Paul McCartney, Enya and in film soundtracks by Vangelis and John Carpenter! This library works with the free UVI Workstation and does not require any additional software. A Massive 2.96GB Library of Classic Synth and Drum Sounds! 281 Presets Covering Drums, Bass, Choirs, Keyboards, Synths, Strings, Orchestral Hits and much more! All the sounds were recorded and carefully selected from the authentic restored instrument, with the very best analog and digital gear, as befits the UVI quality standard. This process allows us to preserve the original sounds’ lo-fi charm. UVI adopted a hybrid approach to create these sounds, combining deep multi-sampling and powerful modeling tools (analog filters, LFO, envelopes etc. ), inspired by the original machine and enhanced with today most modern audio processing and script technology. A simple, yet complete, user interface reproduces the looks and feeling of the most famous and essential machine from the 80’s. With 250+ of the best sounds and primary editing tools, Emulation II enables you to create authentic spin-offs with infinite options of sounds and tones. Recreate That Classic Beatbox Sound With Drumulation! As and added bonus, also included in this package is “Drumulation” – A Beatbox and Step Sequencer with Over 250 Classic Sounds that will be instantly recognisable to anyone who grew up in the 80’s era! This is, as you’d expect, a nod to the E-MU Drumulator and works as a great complement to the Emulation II, with the added bonus that you can manipulate the sounds in ways they could never have imagined back in the 80’s! A choice of two levels of accent. Each of these sequencers has a voice allocated to it and underneath them, there are 4 buttons that allow you to have four unique pairs of sequencers, giving you 8 individual sequences to play with! Once again, behind an apparently simple interface, a nice level of power and complexity is revealed. Each of the eight voice slots is also mapped to your keyboard along with a non-latching start/stop loop trigger at C3. You have 21 preset kits to play with, or you can create your own from over 500 drum samples provided. This is a very neat addition, and incredibly welcome as it is free! So What Exactly Can I Use “Emulation II” For? 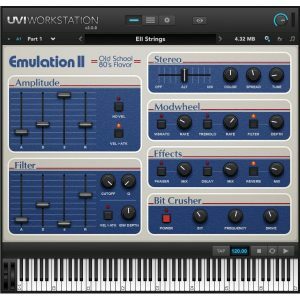 With 2.96GB of classic sounds under the hood, “Emulation II” is the ultimate tool for recreating that vintage 80’s sound beloved by so many. If you’re looking to invoke the instantly recognisable sounds of: Depeche Mode, Peter Gabriel, Pet Shop Boys, New Order, Stevie Wonder or the classic film soundtracks of Vangelis or John Carpenter then look no further! From the Pop culture resurgence to the most modern Electro-Pop, make music without any frontier! Normally €149.00 – get it at 67% before its gone! Absolute no-brainer at 67% off the normal price (normally €149.00)! Instrument Presets cover drums, bass, bells, choir-voices, fretted instruments, FXs, keyboards, mallets, percussion, synths, strings, orchestral hits and more! 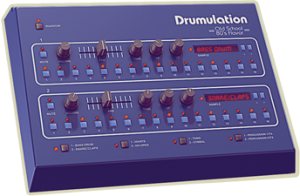 Includes Drumulation – A Classic 80’s Beatbox and Step Sequencer with Over 250 Classic Sounds! As used by Depeche Mode, Peter Gabriel, Pet Shop Boys, New Order, Jean-Michel Jarre, Stevie Wonder, Genesis, Paul McCartney, Enya and in film soundtracks by Vangelis and John Carpenter! Techno, Film Soundtracks and much more!